Hi all! I’m excited to host author S. Usher Evans today on the blog in celebration of her latest novel Resurgence, which releases this upcoming Tuesday! 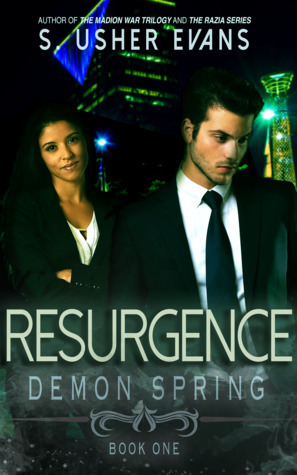 Check out Sush’s writing playlist plus enter to win an ebook copy of Resurgence! Quick note: this is not a YA series, but check out Sush’s Lexie Carrigan Chronicles if you’re interested in reading a YA book! Music and writing are inexorably intertwined for me. A single song or lyric can send me right back into a draft or a finished book. So when Jordan asked me to throw together a writing playlist for her, I was ready! Below are the songs that helped me write my forthcoming urban fantasy novel, Resurgence, the first book in the Demon Spring trilogy. Each book in the trilogy had its own playlist, because each focused on a different emotion. For Resurgence, it was really about clawing oneself out of depression and dark places. Who doesn’t love #Halsey? The first time I heard the song “Control” I was motoring my way toward Dallas for some convention. I had this idea for a character who used to be evil, became good, then was tempted back to the dark side. This was the beginnings of Anya, the demon who Jack and Cam are hunting. She’s changed a lot since those first wisps of ideas, but this song always brings me back to her genesis. You can wear anything. As long as it’s not black.” – Dido, See the Sun . Cam Macarro is probably my favorite character in #demonspring, and joins Lyssa as one of my top female characters I’ve written. She’s layered–confident yet insecure, overcompensating for what she thinks she lacks. But most of all, she’s a damned strong best friend for Jack. Their relationship is truly one of my favorites, because it remains FIRMLY platonic. And we absolutely need more M/F platonic relationships. “But you’ll always be my hero, even though you’ve lost your mind.” Rihanna’s cover of the Skylar Grey song has always taken me to Anya’s struggle. Without giving too much away, the demon may not be all she’s cracked up to be. And her struggle to reclaim her identity is one that I enjoyed writing in the final book of the trilogy. “Oh, I wish I could see you back.” Does anyone else remember Evan and Jaron from the late 90’s/early 2000’s? I always end up sticking with artists I love, even if their albums don’t always do as well as the first. ANYWAY, this song is off one of their EPs, and it’s just one of those feels-hittin’ songs about loss. So, of course, Jack. There’s a line in the book where Jack starts to feel normal again, but then remembers Sara is dead, and it’s like reopening the wound. That’s what this song reminds me of: Someone stuck between reality and the memories they can’t let go of. Resurgence is the first in a new Urban Fantasy trilogy from S. Usher Evans, author of the Madion War Trilogy, Razia, and Lexie Carrigan Chronicles. It is available for eBook exclusively in Kindle Unlimited, and in paperback and hardcover. Enter to win an e-copy of Resurgence! I love Dido and Rihanna! Great idea to explain the book through this playlist. It’s different from other posts. I like it! Thanks, Sophie! I also love the graphics that the author made to gone along with the guest post! Right? I love the graphics the author made to go along with her playlist!